baubles. Sprinkle silver dust as sand on the shore. Imagine quintet. The shadow of a jellyfish tree, one of the rarest trees in the world. A heavy seed as an appetizer. Warning. Do not try cracking this one. The seed of the Coco de Mer, a coconut giant, is the world’s heaviest nut, Bring along Bond. James Bond. For it was here that Ian Fleming wrote for your Eyes Only after a swig of gin and tonic. If Bond is too beefy, get along a dainty, but insolent, Queen. Marie Antoinette shacked here before her death. There’s a moustachioed pirate-and his treasure chest – lending in – trigue. The booty of notorious pirate Oliver Levasseur worth $160,000,000 is still buried in Bel Ombre. So, while you do a quick 160,000,000 mathematics, let me sneak in a quick fact. All this and much more is true about Seychelles, a county comprising 115 coralline islands that are considered one of the oldest on earth. So, shed that clichéd notion of Seychelles merely as a beach destination. There are so many world’s largest, biggest, rarest things in the island that are considered one of the oldest on earth. So, shed that clichéd notion of Seychelles merely as a beach destination. There are so many world’s largest, biggest, rarest things in the island that you’ll probably lose breach counting superlatives. hold in the palm of your hand- the largest recorded Coco de Mer weighed 42 kg! One giant coconut this; its only natural habitat being the Vallee De Mai palm forest in Praslin island, a UNESCO World Heritage Site. Want to stick a straw and quaff the Coco de Mer water? Lossen purse stings, Please. One Coco de Mer costs roughly 50,000 Indian Rupees, One would rather chew gold than drink off this nut! This coconut is not the only case of island gigantism. There is the big, fat, brown Aldabra tortoise, Their home: Aldabra island, the world’s largest raised coral atoll and a UNESCO World Heritage Site. And the biggest, fattest amongst them all is Esmeralda (it weighs 304 kg). This big boy faces stiff competition from a 9ft-6-inch human giant that lies buried in Bet Air Cemetery, Seychelles’ first public burial ground. In the deserted cemetery is an elongated graveyard – lagend has it that the nearly 10-feet human giant died at age 14. It might seem like an oxymoron but all these large, big things live and grow in a small country. Really small country. At the last count, Seychelles has 90,000 inhabitants of which 90 percent live in Mahe, the largest island. Of the 115 islands that string to make the archipelago, only four are inhabited – Mahe, Praslin, La Digue and silhouette. However, nothing beats the tininess of Victoria, the capital. Walk into the world’s smallest capital and before you know where to start sightseeing, it ends. Rather abruptly. You could walk it in 10 minutes and been-there-seen-it-all in another 15, An old church stands like a relic of the colonial age. A Hindu temple shimmers in vibrant colours by the arcade. A cinema resembles a refurbished pigeon-hole. The monotony broken by Victoria market where the air is redolent with the whiff of fresh soursop, cassava, mangoes, vegetables, cinnamon, vanilla and a green leaf that carries the aroma of four spices in one. The crown jewel is the Big Ben. The Little Big Ben, actually. A tiny silver replica of London’s Vauxhall Clock Tower that was erected in the central round-about to mark Seychelles’ new status as the Crown Colony. You might smirk at how little this Big Ben is, but do spare a look for the nearby traffic light. It is only traffic light in Seychelles. ‘Paradise’ is the permanent suffix of this island. I am not sure which gods live in this paradise. Smallest. Largest. Biggest. Rarest. Oldest. These superlatives certainly live in Seychelles. Awise man once said, “Travel is fatal to prejudice, bigotry, and narrow-mindedness. Broad, wholesome, charitable views of men and things cannot be acquired by vegetating in one little corner of the earth all one’s lifetime.” With proven results of the anecdote from our past experiences, and an unambiguous urge to deal with the modern-day phenomena called quarter life crists, two friends along with your’s truly decided to quit our jobs/take sabbaticals to travel, a few months back. Not the usual type of travel though; but a two-month-long backpacking trip. Inspired by a backpacker, who had nor too long ago travelled around the coast of Madagascar, we decided to explore the entire coastline of mainland India and experience life on the waterfronts for ourselves – starting from the Bay of Bengal in the east, then descending south along the Eastern Ghats, before meeting the Indian ocean and moving up the Western Ghats along the Arabian Sea. The fact that such a trip had hardly ever been accomplished in the country made it all the more exciting. On the one hand, we did all of what the glamorous side of travel speaks of – discuss life with people who didn’t speak our native tongues, listen to music not found on the internet and gorge on rustic Indian food. On the other, we also accepted to live through what they don’t often tell you about travel – to be tired and sweaty and dirty without having a place to sleep at night, to get lost and struggle to find our way back, to appreciate the struggles and hardships as much we wanted to admire the beauty of the wilderness. Given the spontaneous and eccentric nature of the trip, the outcomes too were nothing short of compelling. One of them was the pleasant surprise that the East Coast proved to be. It was a conscious effort to start from this side of the peninsula, since not much had been documented about it as compared to its western counterpart. And it definitely did not disappoint. While a cluster of small islands in the southern parts of West Bengal made for adventurous destinations, the shores of odisha flaunted the vivid colours of daily fisherman life and their sumptuous local meals. Andhra Pradesh’s coast felt like an exciting roller coaster with its undulating terrains and Tamil Nadu’s beaches and historic towns summed up the beauty its terra firma. Here, we share with you the most interesting destinations from India’s eastern seashores, so that you don’t have to think too much while packing your bags for the coast when you finalise your plans. Sagar Island or Gangasagar lies on the continental sh elf of the Bay of Bangal, about 100 km (54 nautical miles) south of Kolkata. A pilgrimage destination for locals, the place has a myriad of mythological stories and exotic varieties of fish meals to offer. The approach includes a ride on an fascinating scooter van from Harwood Point and a unique ferry ride from Kachuberia amid the intersection of the Ganges with the Bay of Bangal. Best time visit: Gangasagar hosts a colourful festival at the Kapil Muni temple on Mahavir Jayanti, where you can witness vibrant colours at their best. On the northern coast of Odisha falls a unique beach which rests against the tall magnificence of rising palm trees. The exclusivity of this beach lies in the fact that it is home to Red Ghost Crabs species, which is only found in the Christmas island of Australla elsewhere. The southern tip of Odisha catches the fancy of bird watchers, with the second largest lagoon in the world and the largest wintering ground for migratory birds in the Indian sub-continent Chilika Lake. Though there are touristy boats and steamers which show you around the popular spots in the lake, a public ferry, which costs hardly 10 per head, manoeuvres through the waters where only locals traverse. Best time to visit: Spot birds like the sanderling, terek sandpiper, Kentish plover, and black-tailed godwit best waterways. One of the largest of its kind in India, the Borra Caves in the northern coastal region of Tamil Nadu come into sight around the Araku Valley at a remarkable 800-1,300m above sea level. The excavation spreads across one square km and is also the origin of the river Gosthani which flows through the district. Best time to visit: Enjoy the limestone formations dripping and rising as artsy stalagmites and stalactites amid the hilly terrains, beautiful landscapes and the semi-evergreen moist deciduous forests during the monsoon and winter. A Train journey literally over the sea, followed by an enchanting bus trip along the southern coast of Tamil Nadu, beyond Rameswaram, leads to the ghost town of Dhanushkodi. Though the shutdown of the entire city, after the cyclone of 1964, has isolated it from travel itineraries, the ruins still stand ironically in all their tragic glory. Best time to visit: A deserted railway platform, post office, church and boulders of a formet city greet you in the white sands during the winter months. It’s that time of the year when Puri, the abode of Lord Jagannath, buzzes with activity. Pilgrims from across the world throng to the eastern part of the country to be a part of the world famous Rath Yatra. However, there is something different about this year’s Rath Yatra or Car Festival. Devotees of Lord Jagannath will have the unique opportunity to watch new deities, courtesy Naba Kalebara (the reincarnation) of the Lord, which usually takes place three days before the Rath Yatra, starting on July 18. An ancient ritual that has been in practice since ages, Naba Kalebara means new body. According to tradition, the wooden statues of the deities – Lord Jagnnath and his siblings Lord Balabhadra and Devi Subhadra – are replaced by new idols and their souls transferred. It’s not an annual ritual. It takes place once in 12-18 years, depending on the Hindu almanac. The preparations for this grandiose ceremony start with the search of neem trees, out of which the idols of the deities are carved out. These are no ordinary neem trees. The darus (neem tree) of three deities have different specifications and features. While the log of the neem tree, to be used for Lord Jagannath, has to be dark in colour (since he has a dark complexion), the other two logs for Lord Balabhadra and Devi Shubadra (who have fair complexion) should be of a wheatish hue. There are other stipulations too. The tree to be used for the idol of Lord Jagannath should have four principal branches symbolizing the arms of Lord Vishnu; there should be no nest of birds in that tree; a water body such as a river or a pond should exist nearby and much more. identifying these trees is anardous task. it is believed that the trees are located only after divine intervention by a goddess Mangala, who appears in the head priest’s dream and revels the locational. Once the trees are locted, the entire trunks along with the branches are placed in a wooden cart, dragged by the priests to the temple premises and kept in a secret place. The carvings of the deities which are spread over 21 days are done by the three oldest sculptors of the temple, is allowed to visit the spot where the sculptors are at work. Following the completion of these idols, the deities are carried inside the inner sanctum of the temple and placed in front of the old idols. This is again a very private affair. The worshippers who conduct this ritual are blindfolded, their palms covered with cloth, so that they even don’t know what they are carrying. This ritual, which is conducted after midnight, usually takes place three days before the Rath Yatra. The whole process of transformation culminates with the burial of the old deities. It is believed that if anybody tries to watch any part of this ceremony, he/she will surely die. It is only after the new deities are seated in the Ratna Singhasan that the gates of the temple are thrown open to the public for the grand darshan. Home to the families of the Chernobyl Nuclear Plant, none of its approximately 50,000 residents have ever returned after the devastating explosion on April 26, 1986. Those who have visited this city as tourists, claim that the clock has stopped running in Pripyat. The cars are still parked as they were on that fateful day, the hospital boards still mention the names of the patients, the rides in the park and the discarded shoes at the playground add to the horror. If you plan to tour the city, you’ll have to get a special permit and get scanned for radiation on return. The American gangster was lodged here for a year in 1929. The inmates in this penitentiary, which started operating in 1829, were confined to solitary, dark and independent cells and not even allowed to interact with others; if the prisoners broke any law, they were severely punished. The 142-year-old history of this facility was marred with numerous cases of murder, suicide and diseases; and its ghost stories are all over the internet. You can take an online tour on the following link and plan a visit. This crumbling structure is no castle, but a historic weapon depot of war surplus dealer Francis Bannerman VI. After the Scot acquired more than 90 per cent of the American-Spanish war surplus, he moved the ammunition from New York City to a secluded and safer place – Pollepel Island. The work on the Scottish structure started in 1901 but was stopped in 1981, with the sudden death of Bannerman. Everything ended in 1920 when 90 kilos of ammunition exploded and destroyed most of the structure. The castle has been completely abandoned since 1950. Now , historical tours, weddings and get-togethers are organized here. If you are into wreck diving, try it out at Dun-can Island in the Andamans, where a coal-carrying Japanese ship, Inket, has been lying on the sea bed since World War ll. Though the ship is now a coral reef and home to various forms of aquatic animals, you can still the cargo that it was then carrying, the massive propellers, boilers and engine room, which are still intact. Some say that the 2004 tsunami straightened out the 70 m wreck that was lying on its side. The now inactive diamond pit is the second largest man-made hole in the world after Bingham Canyon Mine, Utah, US. Closed since 2004, this pit is 525 m deep and has a diameter of 1.2 km. Its construction started in 1957 after Soviet geologists Yuri Khabardin, Ekaterina Elagina and Viktor Avdeenko, in 1957, claimed that there were good chances of discovering diamonds here. The downward airflow of this pit – pulled aircraft that flew over it. Also, the harsh Siberian cold would flatten tyres and freeze the machinery in the mine. The downward air flow into this mine had sucked in a few companies continued to mine here post the fall of the USSR, in the 1990s, curtains were called on the mine in 2004. With spectacular views of snow-clad Himalayas, glaciers, streams and high-altitude plains, this winding 490-km-long highway epitomizes adventure at every step. It’s covered in snow for most of the year, and only opens during the summer months, between June and October. Keep your camera ready for some hairpin bends as well! The two-day drive will take you through five mountain passes, including favourites like Rohtang La and Taglang La, the highest point in the journey. If you’re looking for a high-speed blitz, there’s no better stretch than the 165-Km Yamuna Expressway. A ride on India’s longest six-lane highway will take you from Greater Noida in the National Capital Region to tourist mecca Agra, in just over two hours. There are open spaces, green fields, and sundry villages on either side, but the countryside is little more than a backdrop to the smooth tarmac in front. With a speed limit of 100km per hour, the only interruptions on the straight-as-an-arrow road are the five toll plazas. Lined with rice fields, swaying coconut palms, fishing villages and glimpses of the Bay of Bengal, this stats highway in Tamil Nadu runs along the Bay of Bengal, connecting Chennal with Cuddalore. Starting with the quaint Cholamandal Artists’ Village, the Kalakshetra music and dance school and Dakshinachitra crafts centre on the outskirts of Chennai, it has enough to delight both nature lovers and culture vultures. Travel back in time at the UNESCO World Heritage Site of Mamallapuram, soak in Puducherry’s unique French ambience, stroll on the pristine beaches of Tharangambadi, or go boating through Pichavaram’s mangrove forests and backwaters. The journey to everyone’s favourite beach getaway is both smoth and picturesque, though at 600 km, it can get a bit tiring. NH17 runs from Mumbai to Thiruvanan-thapuram, winding its way through the Western Ghats and caressing the Konkan coastline. On the way, there are numerous attractions: On the way, there are trekking at the Karnala Bird Sanctuary, panoramas of Vashishti River meandering through the Western Ghats, and the pristine beaches of Ganpatipule, Diveagar and Tarkarli. The surrounding cloud-kissed hills are at their greenest during the monsoon. The steep turns only add to the thrill. This 8-km long zigzag road on the Norwegian coastline passes through seven bridges, connecting the i s l a n d s between the towns of Kristiansund and Molde. The most famous of t h e s e S t o r s e I s u n d e t Bridge, is known for its thrilling turn that gives incoming visitors the illusion of the road ending in mid-at The ride comes with breathtaking views of the Westfjords, and the surprising glimpses of seals, whales and exotic birds along the way are an added attraction. Daredevils head here during autumn to experience the spectacular storms, but the seaside is equally in calmer weather, thanks to its numerous fishing spots. Completed in 2011, this 2,600-k m – l o n g transcontinental highway links the south American countries of Peru and Brazil, and passes through several dramatically contrasting landscapes. It runs along the Peruvian coast, through remote stretches of the Andes and dense Amazonian rainforests. Stop at the lncan and Spanish colonial capital of Cusco for a slice of history- from here, you can take a diversion to the famous ruins of Machu Picchu. The Amalfi coast in Southern Italy’s Sorrento Peninsula is home to one of the most legenday drives in the world. It is, in UNESCO’s words, ”An outstanding example of a Mediterranean landscape.” Expect stunning sights all along its 50-km sweep, with cliffs, towns and historic terraced villages on one side and mesmerising vistas of the Mediterranean Sea on the other. Stop en route to a d m i r e Positano’s stack of pastel houses, Amalfi’s grand cathedral and town square and Ravello’s hilltop gardens. Don’t forget to taste the local citrus liqueur, limoncello, at the lemon groves in between. How about living like a bird in a ‘nest’ made out of bamboo and wood? Get close to nature by living in these serene tree houses in India. Imagine resting in a resort perched amidst tree branches, waking up to the chirping of birds and walking into the lush forests as you step out of your room. If the whole idea of planning a travel is to escape your routine and have a change of landscape, there’s really nothing quite like spending a weekend in a tree house. And you don’t even have to venture too far into the forested hinterland to find one. An hour’s drive away from the Cochin International Airport, Rainforest Boutique Resort-lies within the verdant environs of the Sholayar forest near the popular Athirapally Falls in Kerala. The resort of-fers a range of lodgings- luxury rooms, premium rooms, celestial rooms, drongo and hornbill suites among others- but the highlight by far is the tree house. The tree house accommodates two adults easily and offers residents spectacular views of the thundering Athirapally waterfall and the surrounding forest. Guests can dine at the in-house restaurant, which serves some unusual local dishes, as well as standard continental fare. The resort houses five tree houses that offer spectacular views of the Bandhavgarh Tiger Reserve and the Bandhavgarh fort in the Umaria district of Madhya Pradesh. Hand-built entirely by the resort’s local staff, all the tree houses are built of wood, and include spacious bedrooms and a living area. The resort overlooks a watering hole, which is frequented by birds and animals, Overall, it is an ideal experience of living in the wild. The three-hour windy road journey from the Cochin International Airport to Thekkady, along the Periyar River, offers spectacular views of the hills of Idukki. Guests heading to Vanya Tree House need to trudge the final 700 metres on foot, Located at an altitude of 3,000 feet, it lies in splendid isolation with magnificent views of the surrounding hills. Surrounded by apple, walnut and plum orchards, Tree House Cottages in Manali are ideal for a quick getaway from Chandigarh, or even Delhi. Whether you choose the tree house or a Swiss tent, you can enjoy the cosy lodgings and types can choose to go paragliding, zorbing and mountain biking, all within a few kilometres of the resort. An hour’s drive from Jaipur, the Tree House Resort offers deluxe nests, luxury nests and private suites, all equipped with modern amenities like air conditioners, wi-fi connectivity, and inexplicably even a television. Guests have a lot to do in their free time- they can opt for a jungle safari, bird-watching tour and a lot more. Those who don’t want to stray too far from the resort can play badminton, volleyball, tennis, billiards, try their hand at archery or just lounger in the pool. The multi-cuisine Tree House Restaurant serves food made out of organic produce grown locally while the Peacock Bar is where you’ll find guests tipping sundowners every evening! You’ll also find a Nature Shop that paintings and handicraft. As the ‘Experience Architect’ for The Times Passion Trails Winter Trek To Ladakh (Feb 14-22, 2015), in search of the snow leopard, I was overwhelmed with the tremendous response. Selecting 13 passionate adventurers out of 1,400 applicants, on an expedition to an extreme environment, with temperatures plummeting to as low as -25 degrees Celsius, turned out to be a humongous job. Ladakh is a mountain desert and its stark barrenne ss is hauntingly beautiful. On landing in Leh, adventurers suffer not only from the effects of high altitude but also willingly suffer from SOS-‘scenic overdose syndrome’. After spending three nights acclimatizing to the altitude and cold in Leh, we headed up to the Rumbak Valley in the Hemis National Park. No mention of Ladakh can be made without saluting the brave sentinels of our borders- the Indian Armed Forces. It is one thing to spend a few days in Ladakh on an adventure trip and quite another to spend years in such harsh conditions, being eternally vigilant. While in Leh, we were fortunate to have spent a delightful afternoon with Ladakh Scouts. Meeting Siachen and Kargil war heroes was the icing on the cake. The rewarding aspect of this trip other than trekking in the Ladakh wilderness, was undoubtedly an opportunity to see some rare species such as the red fox, golden eagle, Lammergeier (bearded vulture) and many other kinds of birds. We camped at a picturesque spot called Husing and since our treks depended upon the movement and signs and symptoms of this great elusive cat, we followed the principal of Nitwit travel, ‘no itinerary travel, wing it tours’. 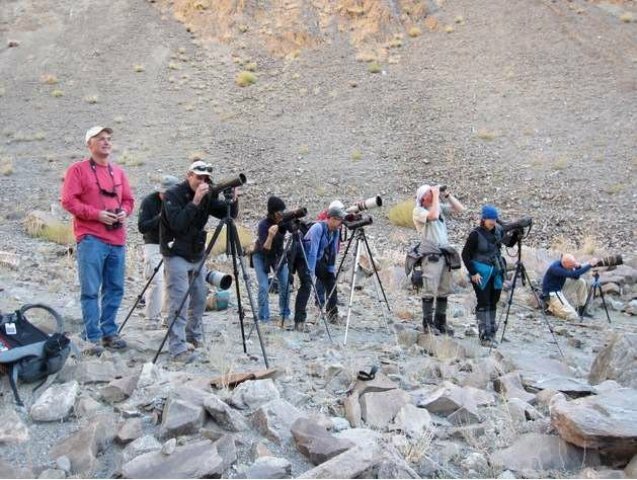 We learnt techniques to maximise the chances of spotting a snow leopard and made excursions to Tarbung and Khardung Valleys to study the natural habitat of the cat. As a team, we decided to ‘tread lightly’ and follow the tenets of the Global Sustainable Tourism Criteria and a strict ‘leave to trace’ policy. One of the highlights was the homestay in Rumbak, giving us an opportunity to get a glimpse of the lives of people in harsh conditions at one of the most remote comers of our country. Given the warmth, hospitality and cheerful demeanour of our Ladakhi hosts, we all wished that we had budgeted for more time in this Shangrila-like village. While at Rumbak we did a delightful hike towards Ganda Lapass (4,370 metres) to look for the Tibetan Argali, the largest wild sheep in the world. As Chander Lall, a senior intellectual property lawyer from Delhi remarked. “People spend a lifetime searching for the snow leopard. There can be no instant gratification out to be a journey of self-discovery in the cold, harsh, barren winter wilderness of Ladakh. We returned as close snow leopard’ and a strong commitment to preserve our high altitude natural heritage.